Lewis Hamilton was unstoppable today as he led Mercedes to their first 1-2 since the 1955 Italian Grand Prix. The Briton had narrowly taken pole position from Sebastian Vettel in the soaked Qualifying session yesterday, but he was untouchable today as he led proceedings from the lights to the flag. The rain which flooded the circuit during Qualifying was gone, but the threat still existed and a mid-race rain shower could not be definitively ruled out. While the team strategists fretted over this news, it was completely irrelevant to Sergio Perez whose Force India stalled during a practice start about half an hour before the race was due to start. The team failed to get the car going again and he missed the race. For the remaining twenty-one drivers, there was no repeat of the aborted start as there was in Australia two weeks ago. Despite a few slow starts, the installation lap got underway and everyone, bar Perez, took their respective places on the starting grid. Lights out and Hamilton shot away while Rosberg ducked up the inside of Sebastian Vettel, who pushed his countryman towards the pitwall in an attempt to keep him behind. He had to fight team-mate Daniel Ricciardo simultaneously and inevitably lost the position to Rosberg who jumped into second. However, a wobble nearly sent Rosberg into the gravel at turn 3 and he had to defend hard against the Red Bull duo into turn 4. The grid, somehow, made it through the tricky turn 1 and 2 sequence unscathed, but Pastor Maldonado and Jules Bianchi came together at turn 4 when the Frenchman outbraked himself. The two were forced to pit for a replacement tyre and front wing respectively, before both retiring afterwards. Before he pulled into the pitlane to end his race, Bianchi became the first driver to earn a five second stop/go penalty. Nico Hulkenberg challenged Fernando Alonso on the second corner of lap two, moving himself up the order. When Kevin Magnussen tried to do the same to Kimi Raikkonen, his front wing punctured Raikkonen’s rear right tyre, giving the Finn a puncture and earning the Dane a five second stop/go penalty. As the drivers got settled into their positions, Williams deployed team orders against Valtteri Bottas while Felipe Massa tried to overtake Jean-Eric Vergne. He had been forced to back out of potential overtakes due to the threat of Bottas behind him, taking to the team radio and complaining. The team told Bottas to hold back. Fernando Alonso and Daniel Ricciardo scrapped for fourth and Alonso pulled an incredible move on the Red Bull into the first corner. Daniil Kvyat also made in-roads after pulling a dummy on Esteban Gutierrez and swooping up the inside. The first round of pit stops came and went and Hamilton kept his lead from Rosberg, who himself led from Vettel. As Jean-Eric Vergne dropped from the race, Ricciardo was told to drop further behind Vettel in order to save the tyres. On top of this, he was back ahead of Alonso after the pitstops, but was slowly falling into the clutches of the Ferrari as his fuel sensor failed. This left Red Bull using the FIA fuel monitors, which they blamed for Ricciardo’s disqualification at the Australian Grand Prix. As if this wasn’t bad enough for Ricciardo, when he pitted for the second time, he was released from his pitbox without his front left tyre being properly attached. He pulled in further up the pitlane and waited, shaking his head, as his mechanics sprinted to the car and pushed it back down the pitlane to tighten the wheel nut. After everything, he had lost a full second to Alonso, who he led before the pitstop and who was directly ahead of him when he left the pits. But Ricciardo’s bad luck wasn’t over with yet – his front wing, possibly damaged by the front jack in the pitlane, snapped on the start/finish straight and left him crawling around the entire circuit before having it replaced. He was subsequently awarded a ten second stop/go for the unsafe release. The end of a miserable day came with three laps left as he pulled into his garage. The Saubers both failed to finish, the first double-DNF for the Swiss team since the 2011 Italian Grand Prix. Adrian Sutil pulled over on the exit of the last corner, a lap before his team-mate, smoking, pulled into the Sauber garage. Nearer the back, the Caterham drivers spent their day holding off a surprisingly off-the-pace Raikkonen. Eventually he passed them and finished his race battling his former team-mate, Romain Grosjean, who will be celebrating eleventh – the race distance is probably the longest running the car has had this season. Williams ended the race the way it started: with team orders. After several laps of ordering Massa to move over for Bottas, he had not moved over and Williams then told Bottas to fight his way past him to chase Jenson Button in sixth. Eventually, Bottas couldn’t get past his team-mate and the duo finished the race seventh and eighth. Back at the front, though, it was Lewis Hamilton who took top honours as he crossed the line, in a league of his own, to take his 23rd career victory and his 100th points finish. Nico Rosberg followed his team-mate across the line, and secured the first Mercedes 1-2 since the 1955 Italian Grand Prix. Sebastian Vettel filled out the podium. Image courtesy Mercedes AMG F1 Team. Lewis Hamilton narrowly took pole ahead of Sebastian Vettel in an enthralling Qualifying session which saw a very delayed start and two red flags as a downpour hit the Sepang International Circuit. The Briton was the quickest driver on Friday morning’s opening practice session, but he had lost his advantage to team-mate Rosberg who, coming from a race win in Australia, had been the quickest man in the second and third practice sessions. It seemed definite that Mercedes would ease themselves to a front row lockout after their 1.7 second gap to rivals in FP3, but when rain arrived thirty minutes before Qualifying, all predictability was washed away. The rain was undetected by weather radars until it flooded the track, but it was expected to dry up just in time for Qualifying. However, the rain was showing no sign of going away as the scheduled start time rolled around. This prompted race control to delay Qualifying by fifteen minutes, and then by another fifteen minutes, and finally by a subsequent fifteen minutes. When Qualifying eventually got underway, there was a line of 22 drivers in the pitlane and, excluding the McLarens, they were all on Intermediate tyres, perhaps suggesting that it was postponed for too long. Marcus Ericsson was left behind in the pits with some sort of mechanical issue, while the others went out on track. Hamilton was the first driver to set a lap, meaning he went straight to the top of the timesheets. However, his time was then beaten by Nico Rosberg. Sebastian Vettel crossed the line in seventh before being told to “box because the car has issues”. He did so and the team discovered a problem with the Energy Recovery System (ERS), a similar problem to the one which saw Kamui Kobayashi miss Friday practice. Red Bull, out of pure desperation, rebooted the system and miraculously it worked, allowing Vettel to rejoin the fight on the rapidly drying track. With five minutes left in Q1, Esteban Gutierrez went off track and momentarily prompted yellow flags, as did Vettel two minutes after the Mexican. However the big disturbance came when Marcus Ericsson slid on a white line exiting turn 3, got sideways through the gravel, hit the barriers and rejoined the track in a terrifyingly close call with the speeding Sauber of Gutierrez who missed the out-of-control Caterham by mere centimetres. This crash, with 35 seconds left on the clock, caused a red flag. Adrian Sutil was the big loser from this stoppage and ended the day in eighteenth, while Maldonado joined him in seventeenth. The other four drivers to drop out at the first hurdle were the predictable four back markers. By the time Q2 got underway, the rain had intensified and necessitated the use of the full wet Pirelli tyres. Raikkonen and Alonso had tried to run with intermediate tyres while the rest of the grid fitted wet tyres. The so-called ‘rooster tails’, the spray which comes out from the wheels, blocked the TV cameras’ vision and the drivers could see even less. Amid the chaos, Daniil Kvyat and Fernando Alonso came together. Alonso, tiptoeing around the circuit, had taken a wide line into turn 11 which Kvyat mistook for the signal to overtake. He also outbraked himself and had nowhere to go as Alonso turned in to take the corner. Kvyat’s STR9 made contact with the Ferrari and broke the Scuderia’s front wishbone – a usually unrepairable damage. A red flag was shown after the collision and this gave Ferrari time to work on the car. Like Vettel’s problem, Ferrari somehow fixed the suspension and allowed Alonso to return to the circuit. As the green light was shown, everyone bar Alonso took to the track. Valtteri Bottas put on a set of inters but his gamble failed as the drivers on wet tyres blasted past him. Although his strategy was clearly failing, and he occupied last place, Williams called Massa in to fit him too with a pair of the green intermediate tyres. On the other hand, Hamilton, Rosberg and Magnussen occupied the top three places with wet tyres. 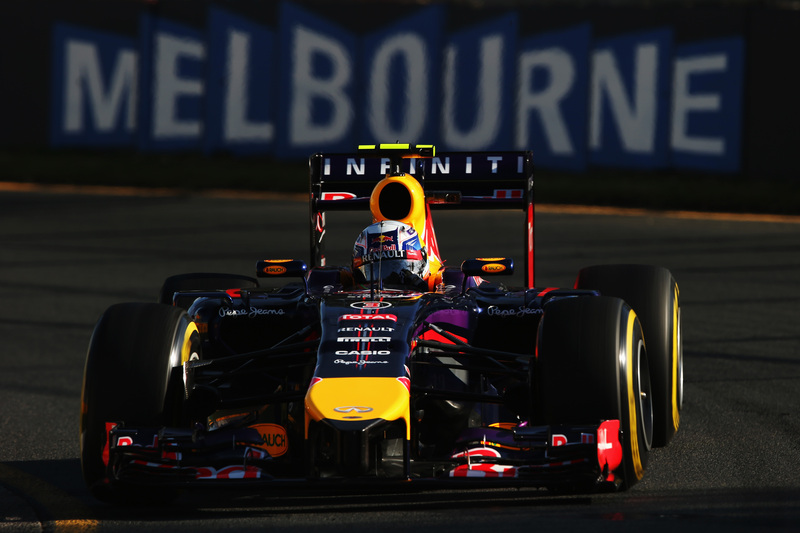 The Red Bull drivers completed their laps and Ricciardo jumped to P2, sandwiching Rosberg as Vettel took fourth. Massa realised his mistake and quickly took a set of wet tyres while Bottas improved slightly to twelfth. Daniil Kvyat narrowly made it to Q3 with a tenth place – until his team-mate jumped into the top ten and pushed the Russian down to eleventh. Grosjean also missed a place in the top ten when he spun out on his final lap. Q3 got underway, and everyone, excluding McLaren, had fitted wet tyres. The gamble wasn’t working, as Jenson Button, whose strength is in the wet conditions, was crawling around the track in tenth. Determined to use inters, he returned to the pits for another set while his team-mate took on a pair of wets. Up front, Raikkonen set the fastest lap, and was then beaten by Hamilton. Rosberg took second, and was then eclipsed by Alonso and Vettel. The drivers, excluding Button, pitted for fresh tyres ahead of the final fight for pole position, but the conditions were getting worse. Vettel missed out on the chance to challenge for pole position, crossing the line a mere two seconds after the chequered flag flew. Hamilton gave up when he drove wide at turn 4, and left the chance of keeping his pole position to the speed of the others. Button finally conceeded defeat and drove into the pits while Rosberg took P3. Alonso went fourth ahead of Ricciardo, Raikkonen, Hulkenberg and Magnussen. Jean-Eric Vergne took ninth while Button was left settling for tenth. With other drivers failing to beat his time, Hamilton took his 33rd career pole position – equalling Jim Clark’s British record which was set at the 1964 American Grand Prix. Nico Rosberg took to the top of the time sheets during the Friday afternoon practice session, taking over from Mercedes team-mate Lewis Hamilton who led the morning session. Rosberg’s fastest lap of 1.39.909 was just enough to edge out Ferrari’s Kimi Raikkonen who was in second. Red Bull’s Sebastian Vettel was merely three-hundredths of a second behind Raikkonen, and held a similar gap over Hamilton in fourth. Fernando Alonso led former team-mate Felipe Massa, who himself led Daniel Ricciardo and Jenson Button. Valtteri Bottas and Nico Hulkenberg filled out the top ten. Jean-Eric Vergne was eleventh for Toro Rosso, ahead of Kevin Magnussen who reported oversteer throughout the session. The Sauber’s of Adrian Sutil and Esteban Gutierrez in thirteenth and fifteenth respectively were split by Toro Rosso’s rookie, Daniil Kvyat, who last week became Formula One’s youngest ever points scorer. Romain Grosjean was seventeenth for Lotus – an improvement, at least, from finishing twenty-second in the morning session. However, his running was still riddled with issues in the afternoon, and his session ended with him jumping from the car with twenty minutes left on the clock. His team-mate failed to get out on track following his smoky exit from FP1. Kamui Kobayashi also failed to run this afternoon, with Caterham still trying to recover the car after finding a problem in the energy store this morning. Max Chilton and Jules Bianchi were eighteenth and nineteenth for Marussia respectively, while Marcus Ericsson was the final person to set a lap, in twentieth. Both Red Bull drivers today expressed their joy that the team managed to get a good days running, and seemed to be in a strong position ahead of Qualifying for the Australian Grand Prix. Red Bull’s pre-season testing was blighted with repeated issues which seemed to write off the chance of a fifth consecutive World Championship for Sebastian Vettel. The situation was so serious that Christian Horner even admitted this morning that he was skeptical if the team could even get a lap completed on Friday. When the green light came on in the paddock, Vettel’s car was scattered like a 3D puzzle across the Red Bull garage. Whether they were sandbagging, or just got very lucky, it’s not clear. Either way Ricciardo finished the first session fifth and the second session sixth, while Vettel finished seventh in the opening session and fourth in the afternoon run. “In a way it’s a relief today,” Sebastian Vettel said after practice today. “The fact that we were running, we didn’t have any problems, the balance was good and the performance looked alright. In the end, Friday times are not worth a lot, but it’s better to be close to the top rather than somewhere towards the back, so I’m very happy with that. His team-mate, Daniel Ricciardo, who replaces country-man Mark Webber at the team, was typically happy with the day’s action: “I knew the guys were doing everything they could since testing but still, we didn’t expect to do that many laps today, so I’m really happy and pleased for them. Mercedes still remain favourites to take pole tomorrow after they led a 1-2 in the afternoon practice session. Image courtesy Red Bull/Getty Images. Felipe Massa set the benchmark during the penultimate day of pre-season testing, but it was Red Bull’s continued problems that provided the talking point. Sebastian Vettel set out for his first run of the day and made it as far as turn four before his RB10 gave out and stopped at the side of the track. His car was collected and shipped back to the Red Bull garage where it was repaired and sent back out on track – only for it to stop at the end of the pitlane a few seconds later. Vettel pushed the No.1 car back down the paddock and to the garage, but it would not emerge for the rest of the day. His final day of testing is tomorrow before the Australian Grand Prix in a mere two weeks. 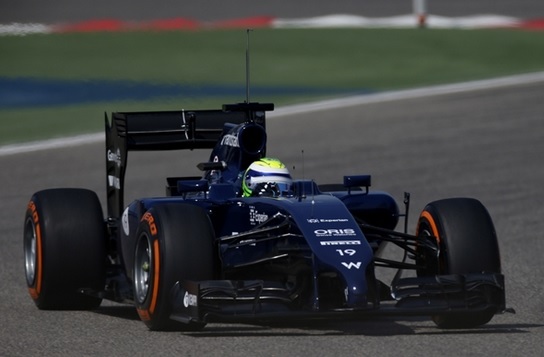 Back to Massa whose 99 laps set him firmly two tenths clear of Nico Rosberg in the Mercedes. Massa also ran yesterday when he placed fourth, and will hand over to Valtteri Bottas tomorrow for the final day of testing. Rosberg underwent a precautionary engine change in the morning session which delayed his running for several hours, finally emerging and clocking up a respectable 103 laps. Lewis Hamilton will pilot the car tomorrow for the final day of testing. Kimi Raikkonen was third overall with a slight delay due to a connector failing which left mechanics stripping part of the car to fix it. In the afternoon his running was as smooth as a fresh Pirelli and he completed a race simulation and several pit stop practices. Kevin Magnussen was fourth for McLaren and his 88 laps left him 2.5 seconds behind Massa’s Williams. Jenson Button yesterday admitted that while the McLaren appeared quicker than last year, it still lacks outright pace. Daniil Kvyat led the time sheets before Massa took over, and eventually slipped down to fifth for Toro Rosso. Behind him was Nico Hulkenberg for Force India who himself bettered Jules Bianchi who again had a strong day for Marussia. His 78 laps added to yesterday’s tally put him at a grand total of 133 laps overall – a promising sign for the team who missed the first test and endured problem after problem in the second test. Their rivals over at Caterham worked throughout the night to fix the problems which caused a fire on Friday, and their work made sure the CT-03 ran smoothly today. Ericsson will be handing the car over to Kobayashi for tomorrow. Romain Grosjean ended his day ninth with a power until problem limiting his running to 33 laps. Adrian Sutil was eleventh for Sauber and also bemoaned problems on his C33 after the car went up in flames as the car was exiting the pit lane. Like his countryman in Red Bull, Sutil’s day was fruitless with no laps on the board. Image courtesy Williams F1 Team. Bernie Ecclestone has declared that he wants to see the double points rule extended to include the final three races. The rule which was brought in for 2014 states that double points will be handed out for the final race of the season – i.e. the winner will be given fifty points and the driver in tenth will get two points. The rule was met with almost universal criticism from fans, drivers and F1 media, and many lobbied for the rule to be completely abolished. Drivers pointed out how one bad day could throw the championship in favour of another driver, while fans pointed out that it made the other races less important. An alternative to the rule, met with mixed reaction, was proposed. The alternative would be a team pre-selecting a race where they would earn double points. The FIA made no comment on this suggestion. Now, however, Ecclestone says that he wants to award double points for Austin, Brazil and Abu Dhabi – the final three races of the season. The logic behind the madness is that he hopes to keep the Championship battle going until the final lap of the season. Sebastian Vettel’s grip on the 2013 season was painful, as he won every Grand Prix with remarkable ease after the Summer break. F1’s audience figures plummeted due to his superiority over the grid.